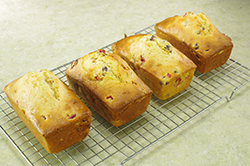 We love to both serve this quick bread and make it for giving to others. 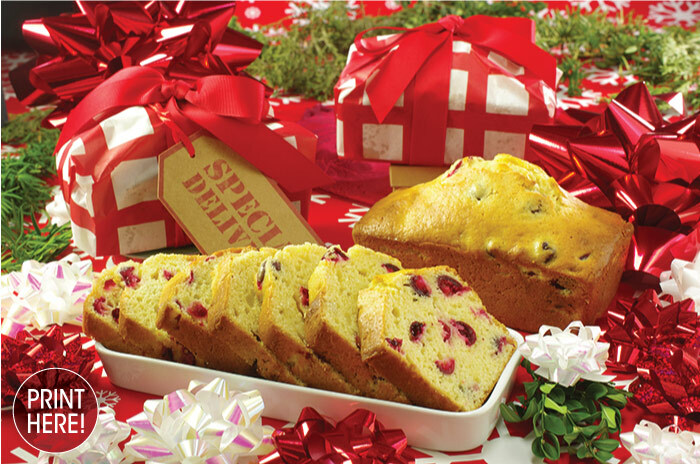 It features another set of classic holiday flavors, cranberry and eggnog. 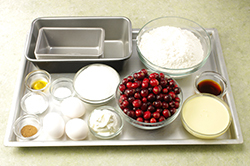 The batter assembles quickly, bakes speedily, and packages nicely. Our favorite way to enjoy this bread? Slice, toast, and spread a little butter. (1) Preheat the oven to 350°F. Prepare the loaf pans by greasing the interior. 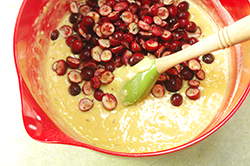 (2) Wash the fresh cranberries in a colander and remove any subpar berries. Spread the cranberries on a kitchen towel, pat dry. Halve each of the cranberries. Set aside. 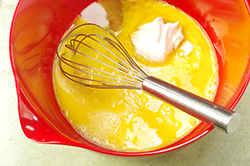 (3) In a large mixing bowl, beat the eggs, add the sugar, sour cream, vanilla, rum extract. 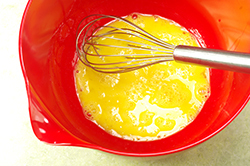 Add the eggnog (or evaporated milk) and whisk together until uniformly mixed. (4) In a separate bowl, mix together the dry ingredients, (flour, baking powder, salt and nutmeg) stirring until evenly distributed. 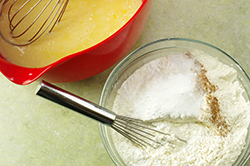 (5) Add the flour mixture to the egg mixture stirring until just mixed and moistened. Fold in the cranberries. Pour the batter into the prepared pans filling each about two-thirds full. (6) Bake until a toothpick inserted in the center removes cleanly. 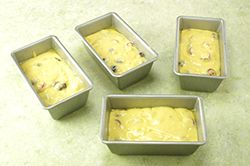 For a large loaf pan (9” x 5” x 3”), bake for 45-50 minutes. 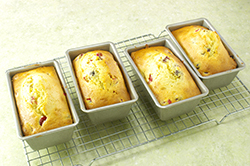 For medium loaves (6” x 3” x 2”), bake approximately 25-30 minutes. Tent with aluminum foil if the outside is browning too quickly. (7) Cool the breads in their pans for 5-10 minutes, then remove the loaves and finish cooling on a cooling rack. When fully cooled, whisk the glaze together and drizzle over the loaves.